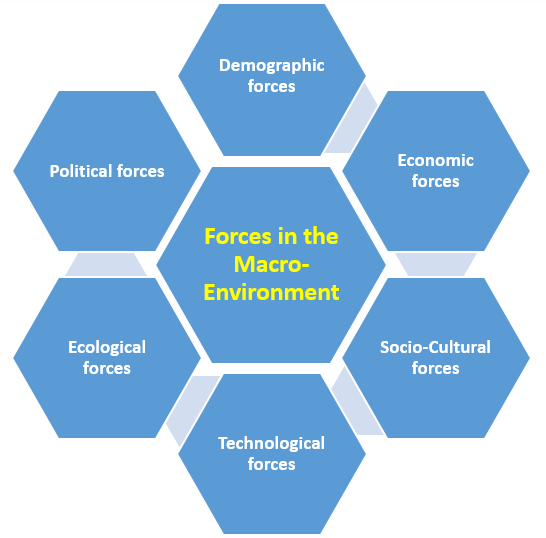 Demographic forces relate to people. The name refers to the term Demography. The latter refers to the study of human populations. This includes size, density, age, gender, occupation and other statistics. Why are people important? Because, on the whole, their needs is the reason for businesses to exist. In other words, people are the driving force for the development of markets. The large and diverse demographics both offer opportunities but also challenges for businesses. Especially in times of rapid world population growth, and overall demographic changes, the study of people is crucial for marketers. The reason is that changing demographics mean changing markets. Further, changing markets mean a need for adjusted marketing strategies. Therefore, marketers should keep a close eye on demographics. This may include all kinds of characteristics of the population, such as size, growth, density, age- and gender structure, and so on. The world population is growing at an explosive rate. Already in 2011, it reached 7 million, while being expected to reach 8 billion by the year 2030. By the end of the century, it is likely to double. However, the strongest growth occurs where wealth and stability is mostly absent. More than 70% of the expected world population growth in the next 40 years is expected to take place outside of the 20 richest nations on earth. This changes requirements for effective marketing strategies and should be kept in mind. The changing age structure of world population is another critical factor influencing marketing. In the future, there will be countries with far more favourable age structures than others. For example, India has one of the youngest populations on earth and is expected to keep that status. By 2020, the median age in India will be 28 years. In contrast, the countries of the European Union and the USA have to face an aging population already today. This may lead to harmful reductions in dynamism and challenges regarding the supply of young workers who, at the same time, have to support a growing population of elderly people. Also, families are changing which means that the marketing strategies aimed at them must undergo an adjustment. For example, new household formats start emerging in many countries. While in traditional western countries a typical household consisted of husband, wife and children, nowadays there are more married couples without children, as well as single parent and single households. Another factor comes from the growing number of women working full time, particularly in European nations. Together with further forces, changing family structures require the marketing strategy to be changed. One – and the most important – element of geographic shifts is migration. By 2050, global migration is expected to double. This has a major impact on both the location and the nature of demand for products and services. The reason is that the place people can be reached has changed, as have their needs because of the new situations. Other important factors are the ethnic diversity that provides new opportunities, as well as urbanisation.